Sunderland thrashed 10-man Cardiff to climb out of the Premier League's bottom three and push the Bluebirds closer towards relegation. Connor Wickham's guided header from a corner gave the hosts the lead. 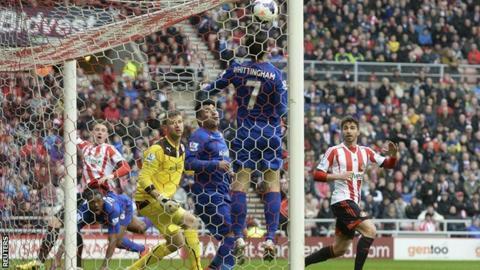 Fabio Borini scored Sunderland's second from the spot after Wickham was fouled by Juan Cala, who was sent off. Emanuele Giaccherini slotted in and Wickham nodded in another corner as the Black Cats moved out of the drop zone on goal difference. Sunderland boss Gus Poyet had spoken of his side needing a "miracle" to stay up and the prospect of avoiding relegation became more of a reality with a first home league win since 29 January. The Black Cats have taken seven points from their last three matches and have a game in hand on the teams below them. They next travel to Manchester United before finishing the season with home fixtures against West Brom and Swansea. Cardiff have the worst away record in the division and their survival prospects look bleak. The Bluebirds are two points from safety and are at Newcastle before ending the season at home to Chelsea. The Black Cats, who had drawn at Manchester City and won at Chelsea in their last two games, applied the early pressure and Sebastian Larsson headed a Wickham cross straight at Cardiff keeper David Marshall before the visitors might have had a spot-kick. Sunderland defender Wes Brown fell into Fraizer Campbell to stop the City striker getting a shot away, although the forward made light of any foul as he got up and chased down the loose ball as the chance went begging. If an organised Cardiff's plan was to stifle their hosts and try to sneak a goal on the counter-attack then their strategy received a setback when Sunderland took the lead. A Larsson corner bounced in the six-yard box before a watchful Wickham did well to steer the ball into top corner for his fourth goal in three games. Sunderland's second came in controversial circumstances. Wickham pounced on an error by Juan Torres Ruiz - commonly known as Cala - and had his arm pulled by the centre-back in an offence which stretched to just inside the area. Referee Phil Dowd initially played the advantage but, when Wickham failed to capitalise, he awarded the home side a penalty and showed a red card to Cala. Cardiff were furious at the decision, but Borini kept his nerve to slot home the spot-kick. Despite being a man down, Bluebirds boss Ole Gunnar Solskjaer sent on winger Wilfried Zaha and strikers Kenwyne Jones and Craig Bellamy. However, the closest the visitors got to a goal was when a deflected Whittingham free-kick was saved by home goalkeeper Vito Mannone. Instead, Sunderland clinched their biggest win of the season as Borini played in Giaccherini to slot calmly past Marshall and Wickham headed in from six yards. "Of course, they (the players) have taken a big blow, but we have got two games - we have got to win those two. "We looked at this one as a possibility for three points but then we have got to look at the next one (against Newcastle) and Chelsea. The next two games, you have got to win them." Match ends, Sunderland 4, Cardiff City 0. Second Half ends, Sunderland 4, Cardiff City 0. Corner, Cardiff City. Conceded by Santiago Vergini. Craig Gardner (Sunderland) is shown the yellow card for a bad foul. Foul by Craig Gardner (Sunderland). Wilfried Zaha (Cardiff City) wins a free kick in the defensive half. Attempt saved. Emanuele Giaccherini (Sunderland) right footed shot from outside the box is saved in the bottom left corner. Assisted by Fabio Borini. Corner, Sunderland. Conceded by Steven Caulker. Attempt missed. Kenwyne Jones (Cardiff City) header from the right side of the six yard box is too high. Assisted by Craig Bellamy with a cross. Craig Bellamy (Cardiff City) wins a free kick in the attacking half. Goal! Sunderland 4, Cardiff City 0. Connor Wickham (Sunderland) header from the centre of the box to the bottom left corner. Assisted by Emanuele Giaccherini with a cross following a corner. Corner, Sunderland. Conceded by Kévin Théophile-Catherine. Substitution, Sunderland. Craig Gardner replaces Adam Johnson. Substitution, Sunderland. Liam Bridcutt replaces Jack Colback. Fabio Borini (Sunderland) is shown the yellow card for a bad foul. Mats Daehli (Cardiff City) wins a free kick in the defensive half. Attempt blocked. Connor Wickham (Sunderland) left footed shot from the left side of the box is blocked. Attempt missed. Jack Colback (Sunderland) left footed shot from outside the box is too high. Assisted by Adam Johnson following a corner. Corner, Sunderland. Conceded by Gary Medel. Attempt blocked. Emanuele Giaccherini (Sunderland) right footed shot from the right side of the box is blocked. Assisted by Adam Johnson. Emanuele Giaccherini (Sunderland) is shown the yellow card for excessive celebration. Goal! Sunderland 3, Cardiff City 0. Emanuele Giaccherini (Sunderland) left footed shot from the left side of the box to the bottom left corner. Assisted by Fabio Borini with a through ball. Attempt missed. Connor Wickham (Sunderland) right footed shot from outside the box misses to the right. Assisted by Emanuele Giaccherini. Substitution, Cardiff City. Craig Bellamy replaces Fraizer Campbell. Substitution, Sunderland. Emanuele Giaccherini replaces Sebastian Larsson. Attempt saved. Fabio Borini (Sunderland) right footed shot from the left side of the six yard box is saved in the bottom left corner. Assisted by Jack Colback with a cross. Attempt blocked. Connor Wickham (Sunderland) right footed shot from the left side of the box is blocked. Assisted by Marcos Alonso. Attempt blocked. Sebastian Larsson (Sunderland) left footed shot from outside the box is blocked. Assisted by Fabio Borini. Foul by Marcos Alonso (Sunderland). Attempt blocked. Fabio Borini (Sunderland) left footed shot from the left side of the box is blocked. Foul by Gary Medel (Cardiff City). Attempt missed. Wes Brown (Sunderland) header from the centre of the box is high and wide to the left following a corner. Corner, Sunderland. Conceded by Kenwyne Jones.